These were the days of the hobos, also called by other names. Many unemployed men traveled by “rail” looking for work, (“rail” meaning that they caught illegal rides on freight trains) and they even came to farm areas looking for a meal or a few hours or days of work. Occasionally one would stop by, apparently walking from the main rail line to the south, to the branch line to the north — maybe 18 or 20 miles. Mama would give them a meal and require them to eat it outdoors. Others tried to make a living selling door to door (farm to farm) everything from magazine subscriptions to washing machines. I believe our family acquired both our Maytag gasoline-powered washing machine and an Elgin sewing machine from traveling salesmen. The magazine salesman were the most frequent callers. They did all they could to make a sale, and often would take produce or chickens rather than cash. We would see them coming down the road, a crate of chickens tied to an ancient car or small truck. You could buy a renewal to your subscription to the Dakota Farmer for the price of a couple of old hens. I remember one salesman who had suitcases of fabric yardage, which he was selling cheap. My mother bought some, including a beautiful piece of light blue silk which she had for a several years before hiring a dressmaker to sew it. She always figured it was “hot” goods. Our family effort to make a few dollars during the 30’s was the candy business. Mama had acquired some candy recipes by having enrolled in a correspondence course in candy making. The school soon went out of business, but they did send the rest of the course material. 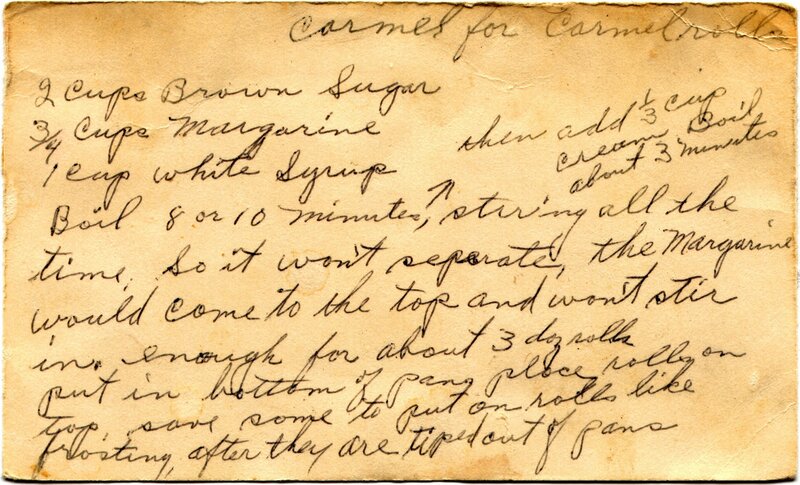 They were very good recipes as most of the family knows from having tasted the caramels which some of us still make. It is now difficult to believe that we sold it for 18 cents per pound. One batch made 6 pounds and took 2 to 3 hours to cook. The ingredients must have been cheap because even at that price it yielded a profit. The biggest season, we made nearly 300 pounds. Mama cooked it, I did a lot of the cutting and wrapping, box making and box packing. And Papa did a lot of the selling. And we all did a lot of eating—someone had to take care of cleaning out the kettle, and eating all the imperfect pieces. This entry was posted in Esther's Letters and tagged Kidder County ND, Lake Williams ND. Bookmark the permalink.